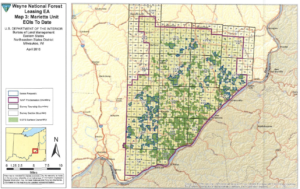 After four years of study, the federal Bureau of Land Management (BLM) has made a final decision to offer 40,000 acres of minerals located in Monroe, Noble, and Washington Counties in Ohio for competitive lease sale for oil and natural gas development under the surface of the Wayne National Forest (WNF) – with 1,600 acres being offered for auction December 13th. With that background here are the six things you need to know about leasing in the Wayne National Forest. #1. BLM debunked activists’ climate claims. To highlight how obvious it is that BLM activist did not even take the time to research the area or draft EA, one of the protests against BLM stated that they ozone issues were not taken into account in the draft EA. Well, had activists actually done their homework, they would know, as BLM rightly pointed out, “Washington County is the only one of the three counties…that is currently in non-attainment for any of the criteria air pollutants (Sulfur Dioxide)”. This is a really important point, because Monroe and Noble counties are in attainment, and that has occurred as production from oil and natural gas has soared in those same counties! #2. BLM opened leasing only to specific areas and with stipulations. The Marietta Unit of the Wayne National Forest was the only unit considered in this recent decision by the BLM. 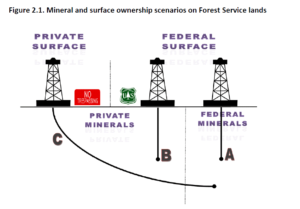 Unlike many other federal forests, the WNF is not contiguous—it is a patchwork of federal land peppered among private acres, and includes privately held minerals located under the federally owned surface of the forest. The map and figure below from the final EA highlight both of these unique issues. Due to the complex nature of the forest and protections for the environment, many of the acres in Monroe and Washington counties to be auctioned in December include a “No Surface Occupancy” stipulation on the entire lease or on designated areas of the lease. The December lease sale includes the following townships in Monroe County: Lee, Jackson, Perry, Green, Washington, and Wayne. It also includes Washington and Liberty County – and all of these acres have stipulations to preserve and protect the environment. #3. BLM’s final Environmental Assessment was significantly more in-depth than its draft review. The final EA is 206 pages, as compared to 112 pages found in the draft EA. 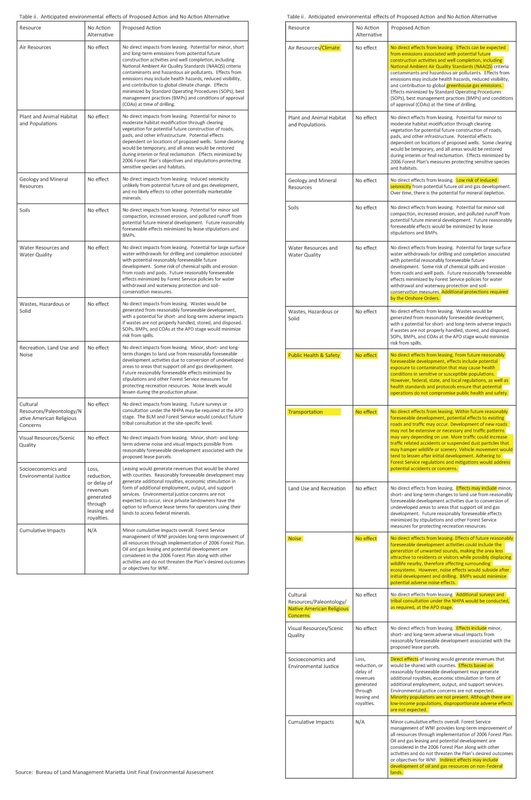 The Final EA added an entire appendix (Appendix A, which is 31 pages long) to address the public comments received between the draft EA and the final EA. The BLM strengthened the final EA to included substantial content around the following areas: agency and tribal consultation, public comment period for the draft EA, greenhouse gas emissions, Ohio climate, public health and safety, transportation, socioeconomics, environmental justice, land use, geology, mineral, and climate change. 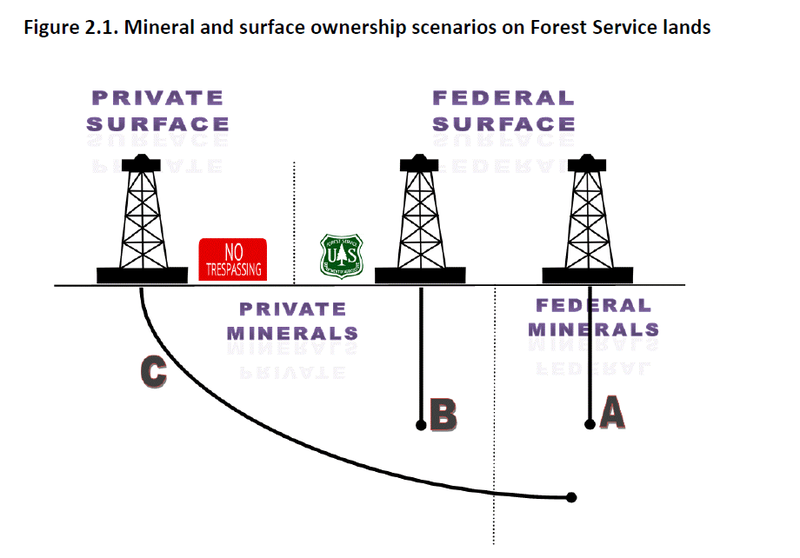 To visually capture the scope of these changes, take look at the side by side comparison of the draft EA and the final EA Table ii, which shows a breakdown of the proposed action (leasing of federal minerals) and the findings of impact, according to the BLM. #4. The BLM reinforced (again and again) that the Environmental Assessment complies with NEPA. The BLM also addressed that they were a cooperating agency with the US Forest Service in 2006 and 2012 as the Forest Plan was updated to address hydraulic fracturing; these reviews also incorporated NEPA provisions as well. #5. The BLM responded to landowner concerns. “In particular, the BLM recently assessed that “the private lands surrounding the Forest Service lands are owned by a variety of people from a variety of income and education levels. Someone who is living in poverty may be more prone than a wealthy person to grant an operator access without carefully considering impacts to his or her household”. #6. BLM points to why it’s so important that UC publish its groundwater study. EID submitted comment into the BLM asking that it consider the University of Cincinnati groundwater study, which is the only study that has been conducted in Ohio after the onset of Utica shale development and is the only study which has used isotope analysis. The study found “no evidence for natural gas contamination from shale oil and gas mining in any of the sampled groundwater wells of our study”. 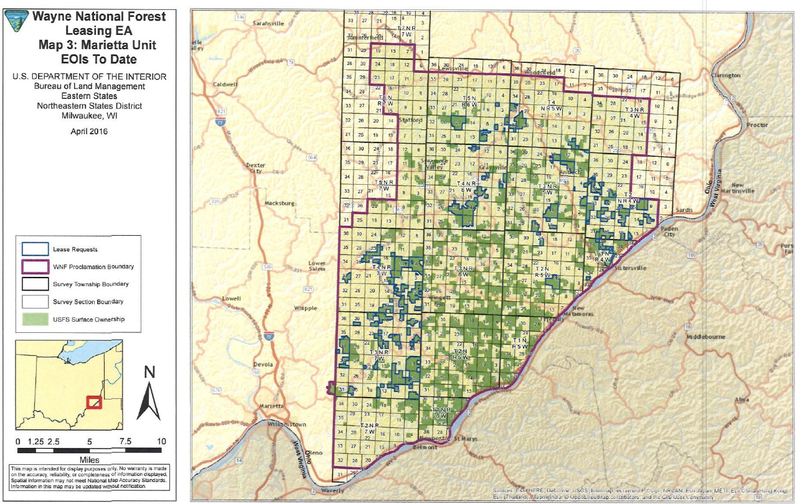 Although the Ohio Environmental Council claims that it plans to protest this final EA, it’s hard to imagine what grounds they would have to do so, as the agency has clearly demonstrated that they made substantial revisions to the draft and found with considerable scrutiny that “there is no significant impact” to the forest to lease federal minerals.